It’s a brisk 22 degrees out at noon on a Friday when I meet up with Jimmy Carbone to accompany him on a trip to his twice-weekly physical therapy sessions at Rusk Rehabilitation at NYU Langone Health on East 38th Street. 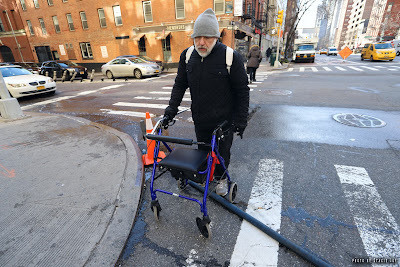 He’s drinking a cup of coffee and is perched on the seat of his walker, cane and resistance band strapped to one side. 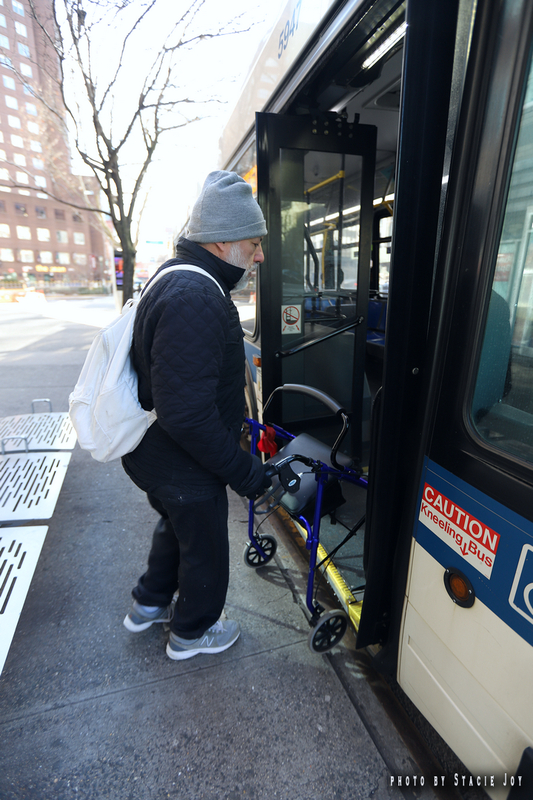 We set out to catch the bus, Carbone’s preferred method of transport since his illness and surgeries. Carbone, an East Village resident and the longtime restaurateur behind the now-closed Jimmy's No. 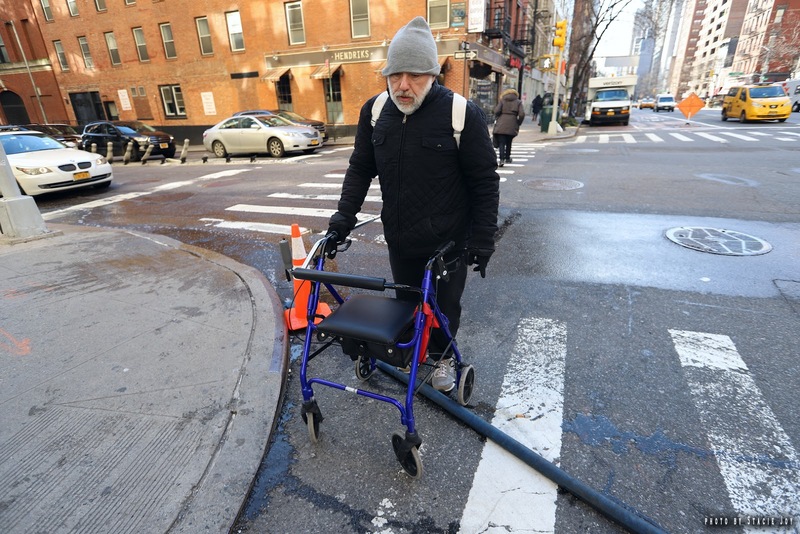 43, talks about traversing the city with his disability, how accessible NYC is and isn’t for those with mobility issues, and what he’s thankful for during his recovery. You’re facing some significant health challenges; can you summarize what happened? In the summer of 2017, I got an undiagnosed staph infection that spread to my spine. I was first hospitalized in October 2017, but it was never diagnosed properly. By June of 2018 I was paralyzed, had two emergency spine surgeries, spent three months that summer in ICU...now I’ve got two titanium rods in my back. It seems so long ago. I’ve been in outpatient physical therapy since the fall. I’ll be on antibiotics forever with the infection, and I will never regain full mobility. You’re entering the eighth month since your last surgery. How are you feeling about your recovery? I’m always positive. I make a point of recording my progress month to month. I get tested each month too. What has been the most challenging part of the recovery process? Learning that I have a new life. Knowing that recovery will take time. I'm sorry, I'm having a hard time reflecting on this. I want to move on ... It’s tough because I try to schedule meetings and too often I have to cancel them because I need a lot of rest. What are the realities of the day-to-day struggles? Starting each day is a challenge. My wife has to help me put on socks and shoes. I need to do in-bed stretches and exercises before I can get up. Washing, dressing — all take thought and time. I can’t just throw on some clothes and start my day. What is something that helps brighten your day? Going outside! 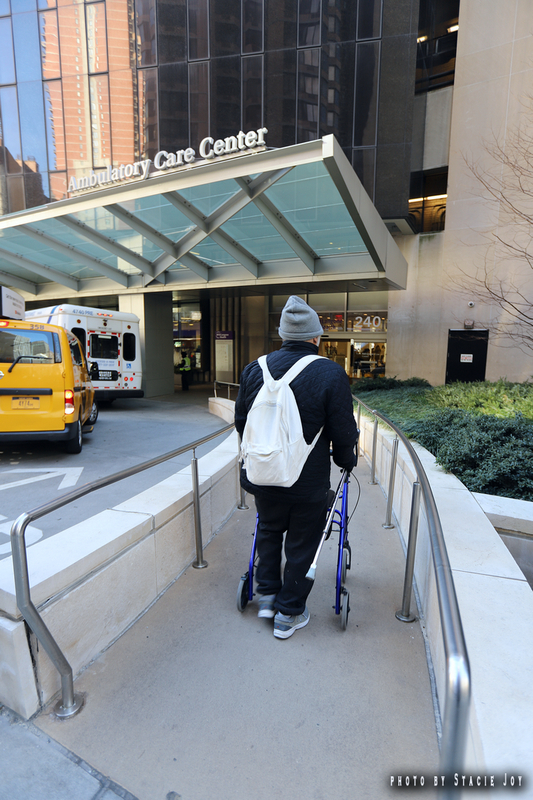 A big part of my physical therapy is getting outside, taking the stairs, walking outside each day as much as I can. The hardest part of my hospital stay was not being able to get out of bed for so long. I like MTA buses and courteous bus drivers — the lifeline of elderly and disabled people. I especially like M103 and M8 buses. In what way has the East Village/local community helped with your recovery? I’ve lived in the neighborhood since 1991 and I opened my first restaurant, Mugsy’s Chow Chow, in 1994. The small biz and community network really rallied after the 2015 East Village gas explosion. [Jimmy's No. 43 is located next to the explosion site on Seventh Street.] I got involved then with EVIMA [East Village Independent Merchants Association] as a founding board member. The merchants have been super supportive: Exit 9, Mud, the Roost, Random Accessories, Block Drug Store, Anthony Aidan opticians, East Village Meat Market, Veselka, the Bean and others, plus community nonprofit leaders like Steve Herrick at the Cooper Square Committee, Harry Bubbins at the Greenwich Village Society for Historic Preservation, and so many more. A crowdfunding campaign has been set up on your behalf to help with expenses. How do you feel about the ongoing support? I’ve been living off the GoFundMe since the end of 2017. In October 2017 things got really bad. I was in hospital for the first time, couldn’t walk. My brother helped me set up the site and encouraged me to share it. Almost 1,000 people have contributed. 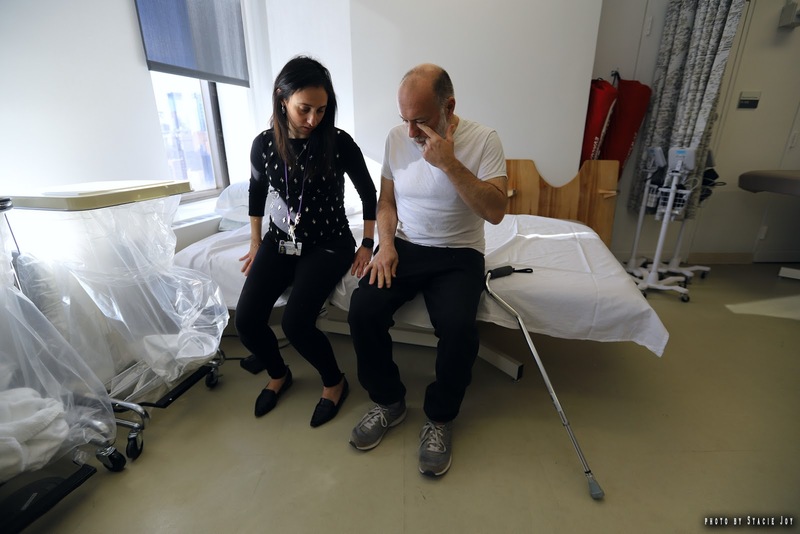 GoFundMe has become de facto one of the largest health insurance safety nets in America. Most money raised on it is for medical-related expenses. You were collaborating with Graham Winton of Paloma Rocket for a new venture at Jimmy's No. 43. What is the status of those plans? It’s been on hold due to my health. It’s still in the works for 2019. I have to look to athletes who have come back from serious injuries for inspiration. Ryan Shazier of the Pittsburgh Steelers was paralyzed, one year later he was walking in public. He is still recovering. My surgeon says it will take on average one and a half to two years for recovery. So that puts me at the end of 2019. What are you most looking forward to in a year’s time? Two years? I’ve got intense physical therapy for this year and I’m trying to stay healthy in general. There will be news with EVIMA, moving forward, as an independent merchants association with City Council member Carlina Rivera. I’m taking time to get more involved in public affairs. I’m wrestling with this. I want the spine thing, the rehab and recovery to be over...but I also want to keep telling my story because I still need people’s support. I also want to acknowledge the East Village people who supported me through this journey. 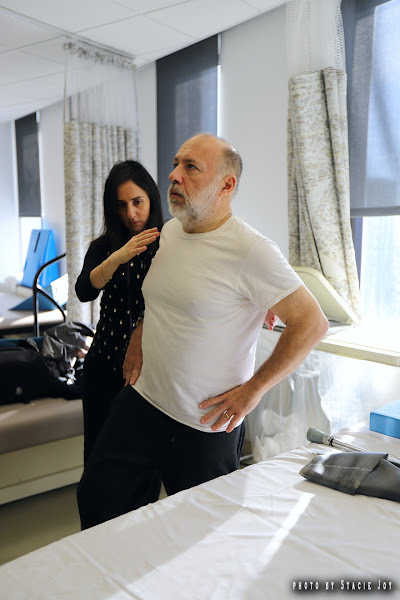 Carbone and NYU OK'd Stacie taking photos during a recent session with Dana Lotan, senior physical therapist at Rusk Rehabilitation at NYU Langone Health. I hope he feels better soon! This is a really inspiring story about a guy with a positive attitude. Thanks EVG. Hang in there Jimmy, you will get better. 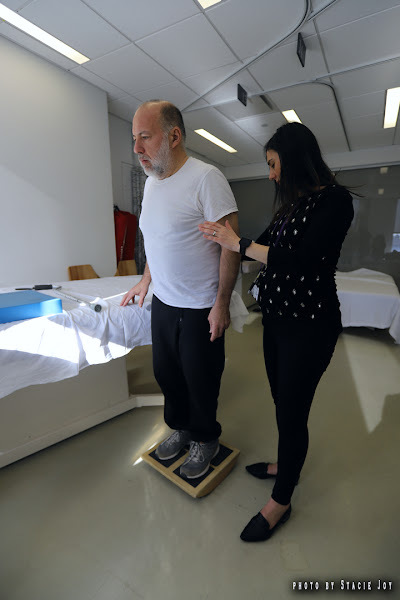 Rusk Institute is one of the best places to go for rehab, but only if you can get in, and only if you can afford it or if your insurance allows it. It’s a good thing he had a GoFund me, but fundraising sites can not overcome the need for universal healthcare in a country where we are being price gouged. Diabetes is no joke, and now that insulin costs-7-8 more times than it did in 2000, people are traveling to Mexico to get their supplies which can cost $1,000 per month, I thought that Trump said he would lower the cost of prescription drugs? I guess not. Just want to say - no politics or agenda - that this is a good story, keep them coming! High Five Jimmy! We’re all cheering for ya!!! Jimmy, I don't know you personally but I'm sorry for all that you've been through and I hope that your health will continue to improve. You're certainly getting the best care at Rusk. 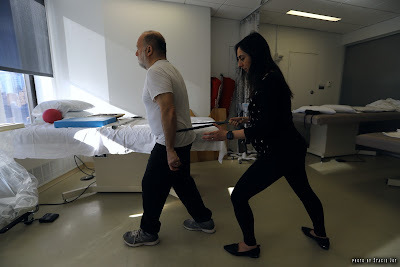 I know physical therapy is a lot of hard work for the patient, and I applaud you for being so determined to get better. Sending you all best wishes; may each new day be better for you than the day before. And yeah, Grieve, this is the kind of neighborhood news that matters just as much as anything else you cover. PEOPLE news! Love this story, thank you. Get well soon Jimmy! Jimmy it's awesome to see you doing so well!!! I know you still have a long road ahead but seeing you walking and making your way around the city by yourself is a huge relief!!! You also look GREAT. Keep it up! And thanks for the article Grieve. 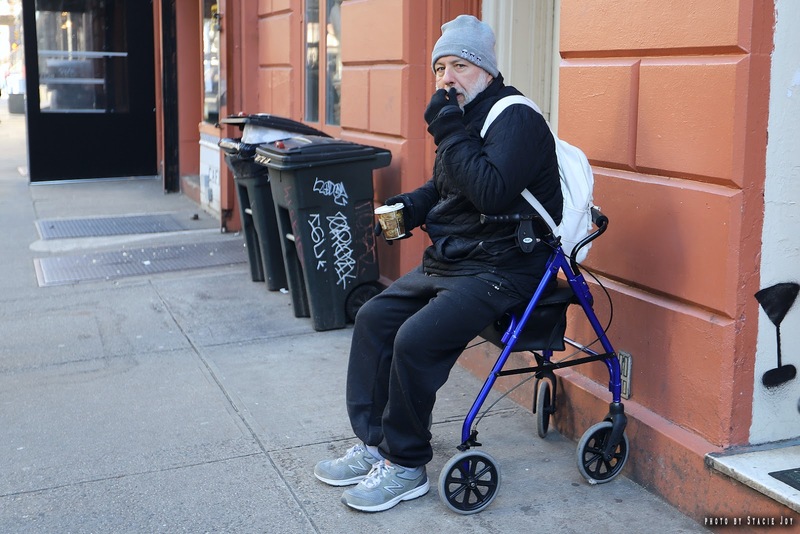 Jimmy is a vital community member of NYC, the East Village, and the nyc food and drink community. You are inspiring me! 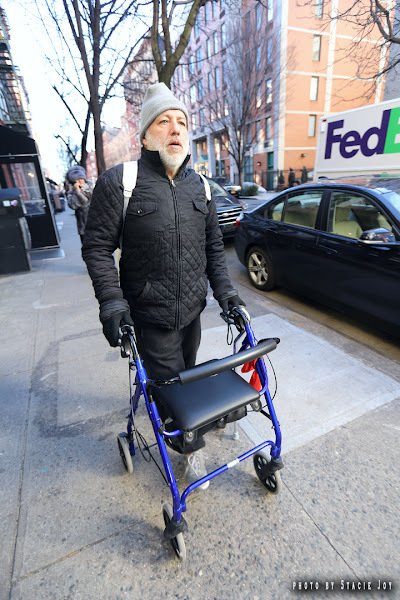 I just had the first of two complete knee replacements and have been using a walker for the last month. Seeing how you are doing is inspiring. Keep it up. I hope to see you the next time I am in NYC. Needless to say, the Art Studio at Lag feels your absence more than you can know! I was so happy to see Georgia's piece get selected for Rising Stars. It's beautiful! Hope to see you soon! Keep pushing--I can't imagine how hard it must be, but hopefully you can draw from all the cheering on the sidelines.